The Crawford Fund and the DFAT Council on Australia Latin America Relations are supporting a visit to Mexico by two Australian journalists to cover the celebrations of the life and work of Norman Borlaug, father of the Green Revolution. 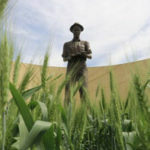 The Borlaug Summit on Wheat for Food Security is celebrating the life and legacy of tireless hunger fighter Norman E. Borlaug, bringing together thought leaders, policymakers, and representatives of leading agricultural research-for-development organizations, both public and private. 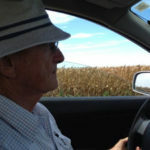 Dr Tony Fischer as he drives the journalists through rural Obregon. Credit Kim Honan. 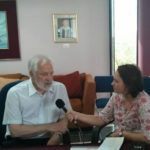 Kim Honan from ABC Rural and Neil Lyon from Fairfax regional papers will be reporting nationally with a wide range of stories related to wheat research and Australia’s strong involvement in and reliance on CIMMYT work. As recently reported in the Fund’s ‘Doing Well by Doing Good’ report, the benefits to Australia from CIMMYT’s work has been tremendous. 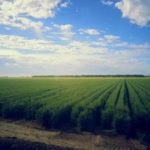 By 1994 more than 90% of the area sown to wheat in Australia was sown to CIMMYT and Borlaug’s semi-dwarf varieties, worth almost $240 million a year for the period 1974 to 1993. In addition, many of our key wheat researchers, as well as our breeders have benefited from working at or with CIMMYT. Neil and Kim’s jam-packed program included interview arrangements with many of the Australians attending the Borlaug Summit. They will then travel on to visit CIMMYT headquarters to tour the genebank and other facilities. As reports are available below, and more will be posted in the coming days.